Although they were up against some pretty stiff competition, we had nothing but total faith that JP and Julia’s er, original burger recipe would be a success. 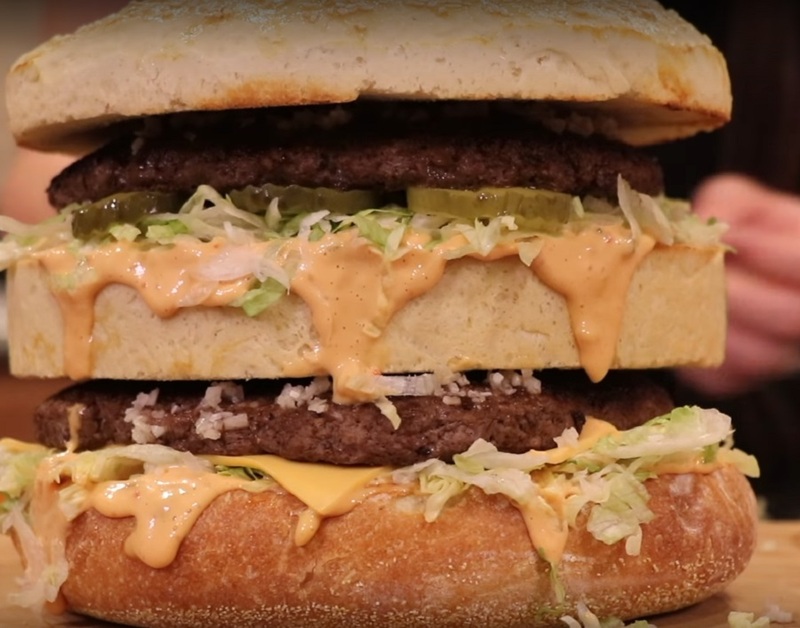 TBH, we’re still marveling at their DIY supersized Chicken McNugget recipe, so we expected this bigger-than-average Big Mac to be nothing short of mouthwatering, sesame bun-bouncing perfection. Like pretty much everything they cook, the caloric content for the “larger than normal Big Mac” is a mind-boggling 4,125 calories (a portion of which is owed to regret), which makes us super relieved that JP and Julia split the burger with a few of their friends. We would suggest pairing this burger with Hellthy JunkFood’s DIY butterbeer, but unless you’re a competitive eater, your stomach probably won’t have much room for it.